This was a first for Marketo, my software company. I wanted the EV drivers who work here to share with other employees, so I got a small budget to host a lunch and bring folks together for an extended lunch hour. We did get some people from other companies in our buildings, too, and a few folks who came because the learned about the event on the NDEW website. I did most of the planning and legwork myself, but will know better how to delegate tasks next year. I got good suggestions from my small team. 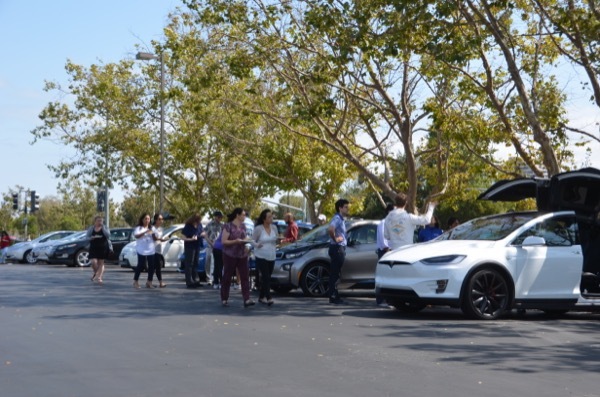 Join us to celebrate the electric car at Marketo! Check out the Chevy Bolt and Volt, Tesla Model X, Fiat 500e, and other EVs. iJava will be serving free sandwiches and wraps (1 per person) and salad. This event is open to the public. Please register by clicking the blue button at the top of this page and you'll be entered to win a chance at a $250 gift card. Registered attendees report 197,428 electric miles driven.